Sleeping and good resting are one of the prepositions for having good heathy and productive life. In order to have physical and psychological balanced health for sure we should have good night sleeping. Many researches have confirmed that the good night sleep is essential for quality of life. If from some reason one person has lack of sleep is more prone to obtain some of the disease like dementia, diabetes, hair loss and even premature aging signs. A study conducted back in 2014 showed that almost 45% form the Americans suffers from a lack of sleep at least once in 7 days. These are some of the reason why we cannot have good night sleep. But among these reason body positions seems to be the key for the missing sleep. 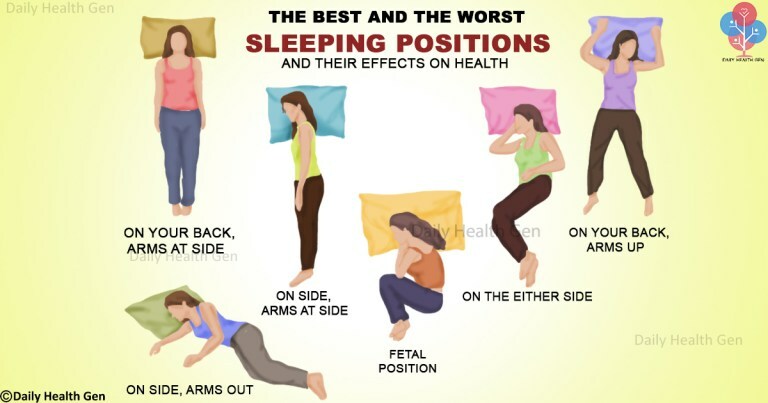 The positions you have while you sleep affect your health in general. Sleeping posture can be contributor for brain disorders like dementia, Alzheimer’s, and Parkinson’s. But also sleeping position can be responsible for snoring, acid reflux, heartburn, sleep apnea and believe it or not even wrinkles. Pros – As the back remains straight while you sleep on your back is probably the best position for your spinal health. Acid reflux can be reduced by sleeping on your back, while your breast can stay perky and you will reduce appearance of facial wrinkles. Cons – common issues associated with this sleeping position are sleep apnea and snoring. When you sleep on your back, gravity forces the base of the tongue to collapse into the airway. This obstructs breathing and causes snoring that can keep your partner up at night. In order to reduce snoring caused by this position you can combine sleeping on the back with side sleep pose. The results would be refresh and rested person ready for the next day. Or try to sleep on your back without pillow, place your neck in neutral position. Using more pillows can make breathing more difficult. It is best to use a large pillow under the back of your knees to support the natural curve in your lower back. You can also use a buckwheat pillow under your head to support your neck when you lie down. Position: Lying down on your back with your arms resting beside your face and above your head. This is also called the ‘starfish’ position. Pros – the spinal and the neck health require back sleeping. In this position your spine and neck are reduced from the pain because of the lowered pressure on the discs. Also in this position the stomach is able to sit below the esophagus which prevents and reduces acid reflux. You are also protected with obtaining facial wrinkles and skin breakouts. Cons – this position can cause snoring a little bit or pain on the nerves in the shoulders because of the raised arms above the head. Place your head, neck and spine to rest in neutral position by not using a pillow. With this position you will avoid extra pressure on those areas while you are sleeping. Position: Sleeping on your side with both arms positioned downward in a straight line. This is also referred to as the ‘log’ posture. Pros – Great position for resting the spine because receives natural and complete support in this natural curve. You are protected from getting back and neck pain and also sleep apnea can be reduced. Cons – since the legs are not getting enough support in this position there are chances for developing back or hip pain in the future. Sleeping on the side can lead to skin aging, sagging breast, wrinkles or even neck pain. Thick pillow under your head would be ideal in this position. Remember that f you use satin pillow cases you can prevent facial wrinkles. Position: Sleeping on your side, with your legs slightly bent, arms outstretched and head slightly angled off center. This is also known as ‘the yearner’ position. Pros – With this position you can avoid back and neck pain. Not to forget that snoring is reduced on minimal level and you can ease heartburn and acid reflux. Not only this, this sleeping posture even allows the body to clear waste from the brain more efficiently and reduce the risk of developing brain disorders like Alzheimer’s and Parkinson’s disease. Plus, people who sleep in this posture are less likely to wake up in the middle of the night. This is mainly due to the comfort your body gets during sleep. Cons – this position can cause pain in the shoulders because of the restricted blood flow. Nerve compression may place strain on internal organs like the stomach, liver and lungs, which can cause discomfort. Satin pillowcases can reduce the appearance of wrinkles and a pillow between your legs can help you to support the legs. Position – Sleeping on either your left or right side. Pros – Snoring, acid reflux, sleep apnea and back and neck pain can be reduced if you sleep in this position. Sleeping on the left side is beneficial for pregnant ladies, as it helps improve blood circulation to the fetus. Cons – But the side effects are: worsen heartburn, strain on your internal organs like the stomach, lungs and liver. If you suffer from any kind of stomach, lung or liver problem, switch to the right side. Also premature aging which can leads to sagging breast and facial wrinkles due to the gravity. Solution: Pillow between your knees will help you to make the position more beneficial for the health and of course satin pillowcases in order to reduce wrinkles. Note: Avoid resting the head on one arm only. Position: Sleeping all curled up on either side, in a ball-like position with your knees drawn up to your chest and chin tilted down. Pros – Great positon for pregnant ladies and also reduces the snoring on minimum. Cons – Sciatic nerve pain can be cause in the future because of the pressure put on the neck and back. Solution: Use a firm pillow to support your head. It is also recommended that people sleeping in this position alternate sides during the night. Position: Sleeping on your stomach with your head turned to either side or your arms embracing the pillow. This type of sleeping posture is also known as the ‘freefall’ pose. Pros – This position is good for improving the digestion on certain level and to avoid snoring, but sleeping for longer period in this position can lead to negative impact on your digestive system. Cons – Sleeping on your stomach may be considered the worst sleeping position, as it causes overarching of your spine. Solution: If you really love this position try to combine with sleeping aside by using a pillow between your stomach and the mattress. The pillow will prevent lying on your belly for the whole night.